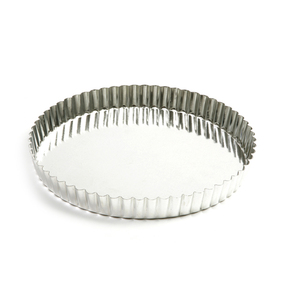 Versatile tin pans can be used to bake both quiche and tarts. The loose bottom facilitates easy removal of the baked product. Fluted design makes for a stylish presentation of any baked entree or dessert. Pan measures 9.5"/24cm diameter and 1"/2.5cm deep. Made of Tin. Hand washing recommended.